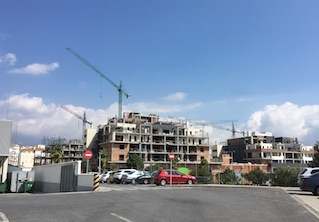 Cranes have begun to litter the Motril skyline again, after the construction sector ground to a halt during the worst of the housing-bubble crisis. Take a look around the Al Campo area and you’ll see several building cranes and an apartment-block building just about the Ronda Sur road, which links Al Campo to the Port Road. And all this without including the commercial centre where the new Burger King stands. Mayor Flor Almón says that whilst other municipalities have exhausted their available plots, Motril still has plenty. To give you an idea how things have changed in that sector, in 2014 only eight dwellings were built, whereas last year they began 134, which are still under construction. As for this year there are going to be 233 more. According to Srs. Juan Fernando Pérez, who is the Head of Servicio de Urbanismo, they have issued 122 building licences for major builds and 528 for minor ones so far this year. A total of 87 of them will on Playa Granada, so we’re talking about second residences or holiday homes. Another area that will see new builds will be on the old bus station plot, as well as next to the Parque de las Americas (where the tourist information office is). In fact, the near future will see a total of 8,000 dwellings, 3,000 of which will be down on Playa Granada. This entry was posted on Saturday, October 6th, 2018 at 1:21 am	and is filed under Motril. You can follow any responses to this entry through the RSS 2.0 feed.